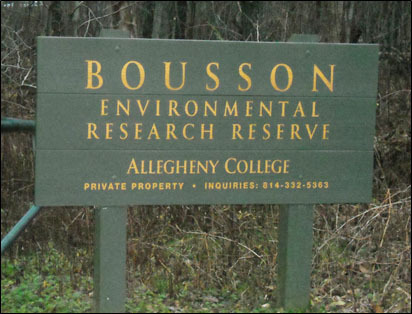 Bousson Environmental Research Reserve is located in Frenchtown, PA about seven miles from Allegheny College. The history of Bousson includes events that gave it a very good name, and events that nearly destroyed it. While the Bousson family lived at the mansion just off of Oil Creek Road, life was luxurious. However, hard times struck and the family was forced to leave. While under Allegheny ownership there have also been proud moments, and not so proud moments, in its history. As the College and the Bousson Advisory Group weigh the advantages and disadvantages of hydraulic fracturing on the property, the future of Bousson lies in the hands of Allegheny trustees, students and faculty to come. Allegheny College acquired the Bousson property in 1935. Before that time, the Kiwanis Club of Meadville had purchased 143 acres of the 321-acre property from the sheriff’s sale in 1928. The Kiwanis Club sponsored a Boy Scout troop and the property was used as a summer camp for the boys. 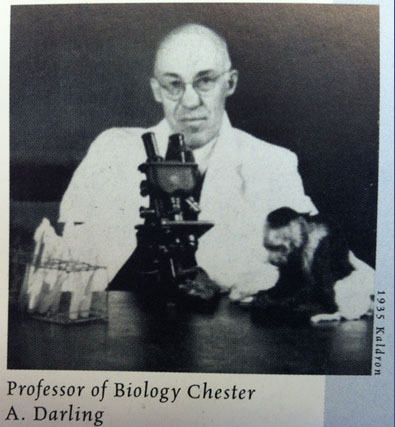 The troop was led by Dr. Chester Darling, who was the Chairman of the Allegheny College Biology Department. Under his direction Allegheny College purchased this land from the Kiwanis Club in May of 1935 for $1,500. When Allegheny bought the property, the larger of the two barns and the “heavily vandalized” Bousson mansion were still standing. The Kiwanis Club had torn down the smaller of the two barns because it was in shambles and was not worth trying to renovate. In the late 1930s Allegheny razed the mansion. The biology fraternity Phi Beta Phi, whose advisor was Dr. Darling, moved onto the site and began constructing a cabin at about the same time as the Outing Club began building a cabin of its own. 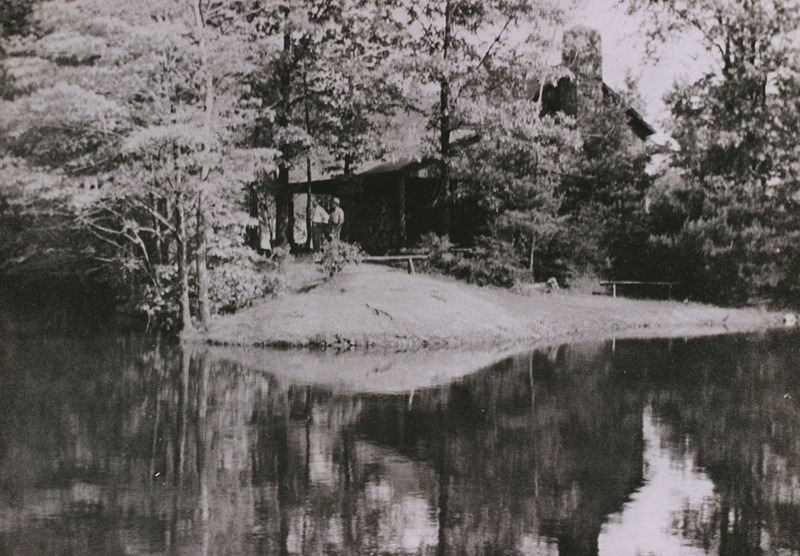 The Phi Beta Phi cabin was located a mile northwest of Lake Siple: where the Outing Club cabin, also known as the student cabin in the late 1950s and early 1960s, was located. Lake Siple was already on the property, but the college deepened the lake for swimming and built a dam and a spillway. The Phi Beta Phi cabin was finished in December of 1936 and the larger Outing Club cabin with a huge stone fireplace and slept about 30 students was finished in May of 1937. Bousson was also a place of environmental and biological research for students and faculty. The Phi Beta Phi fraternity was continuously conducting research in the forest of Bousson and using Lake Siple as a water ecosystem. In the early 1940s and into the 1950s a “Summer Session” was offered by Allegheny College for students to stay on campus over the summer and conduct research at Bousson. The 1960s and 1970s were not kind to the Bousson property and the cabins, and vandalism and particularly rowdy college students became a normal occurrence on the property. 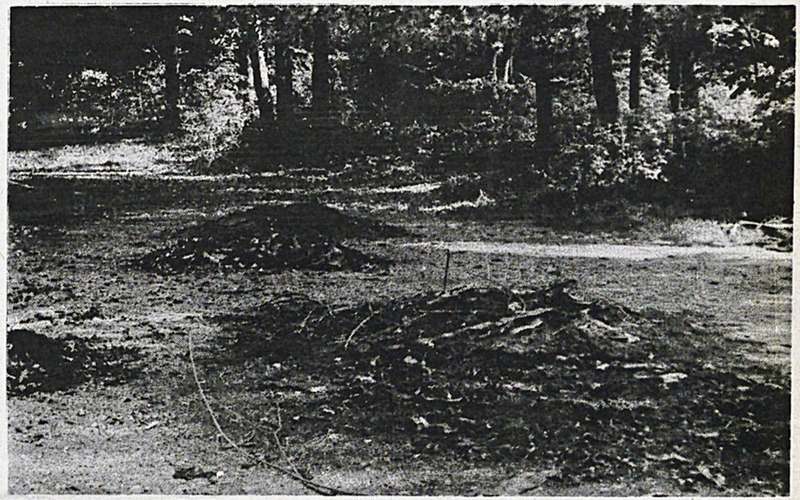 On commencement day in 1981, when there were no students or faculty around, the cabins were razed and the debris from the cabins were mostly left at each site on the property. From the 1980s to today, the Bousson Environmental Research Reserve has been living up to its name as a place of scientific research of the forest. Meredith Gumash, “Bousson Environmental Research Reserve,” NW PA Heritage, accessed April 26, 2019, http://nwpaheritage.org/items/show/32.